Request a Complimentary Consultation for Invisalign or Braces at our Longview orthodntist office by Clicking HERE. 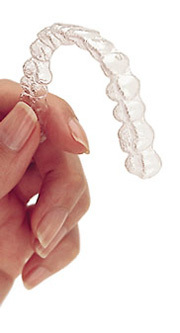 Invisalign clear aligners have changed dramatically since they first came on the market in 1999. Ever since the introduction of their patented SmartTrack material in 2012 the capibilities of these "plastic trays" has increased significantly. Dr. Mack and Dr. Hansen were trained in residencies placing a strong emphasis on this new and improved orthodontic treatment. Having recieved training from orthodontists in the top 1% of Invisalign providers worldwide, Dr. Mack and Dr. Hansen are comfortable treating even the most complex and difficult cases effectively and efficiently using Invisalign clear aligners. Invisalign treatment uses a series of virtually invisible, removable, and comfortable aligners. Invisalign clear aligners are made with 3D computer imaging technology based off an intraoral digital scan of your teeth that we take right in our office. In fact, Dr. Mack completed her Master's Thesis on the iTero intraoral scanner that is used in the Invisalign process. Not only are the aligners virtually invisible, they are removable, so you can eat and drink what you want while in treatment. Plus, brushing and flossing are no problem. They are also more comfortable than traditional braces, with no metal or wires, which also means you spend less time in our office getting adjustments. Dr. Mack and Dr. Hansen program tooth movements to allow patients to change their aligners every week or so, making treatment more efficient,as well as comfortable, for you! Visits at our office are typically every 8-12 weeks with this type of treatment too. Another neat aspect is that Invisalign treatment also allows you to view your own virtual treatment plan when you start so you can see how your straight teeth will look when your treatment is complete. When undergoing treatment with Dr. Mack and Dr. Hansen, you will wear each set of aligners for about a week, removing them only to eat, drink, brush, and floss. As you replace each aligner with the next in the series, your teeth will move — little by little, week by week — until they have straightened to their final positions. You'll visit us about every 8-12 weeks to ensure that your treatment is progressing as planned. Total treatment time is usually between 9 to 15 months, but some cases are shorter, some are longer. If you would like to learn more, you can request a complimentary consulation by clicking HERE. If you have any further questions about braces, invisalign, early orthodontic treatment or would like to set up a complimentary orthodontic consult for you or your child, please give our Longview Orthodontist office a call at 903-212-7737.